Battling the elements for turkeys is hard work. Part one covered hunting on hot and windy days, but there is still some bad weather to be considered. Rainy and snowy days are just as ugly and here are some of my tactics that I have learned to use during these terrible weather days of hunting. Much like extremely hot days, turkey hunting is terrible on really rainy days. And just like hot days, turkeys in the rain are usually huddled up under heavy cover while acting like zombies. 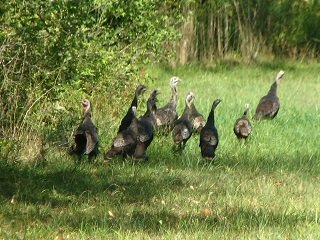 They meander around mostly and take turns sleeping while standing up, so the chances of calling a bird out of that kind of a situation is really wishful thinking for any turkey hunter. If your hunting day is not featuring a continuous downpour, then you need to be in the woods hunting. Unlike all the other bad weather, light rains can still offer some decent success rates. However, if it is only lightly raining in the morning, don’t forget that wet birds take way longer to fly out of their roosts in the morning, so don’t give up too early and walk away from a known hotspot. Just wait them out and let them fly down on their own, grouchy time. Turkeys hate rain. It messes with their hearing especially, so if conditions are huntable get to a field or open area you know they like because they will end up there eventually so they can see their surroundings to make up for their lack of hearing due to rain drops hitting their exposed and open ear holes. Concerning calls, you will only ruin your slate or box calls in the rain so make sure you are proficient with mouth calls or squeeze calls. With some of the crazy weather the country is experiencing lately, it is not uncommon to have snow on the ground, somewhere in the country, during some part of turkey season. Hunting in snow can be another undesirable turkey hunting scenario. If you find yourself hunting in the snow, you will have to gauge the bird’s activity but most likely you will want to find leeward places to hunt where snow has not accumulated too deep where it could be an obstacle for approaching birds. If it is spring time, you can experience hot gobbling action, so it is up to you to provide a path of least resistance for any excited gobbler that is interested in checking you out. Most likely, you will want to be hunting near trees if it has snowed. Birds rarely feel comfortable leaving cover with snow on the ground as it gives them less of a chance to run to safety. Finally, snow makes it easier to see any dark or moving objects so go slow and make sure they don’t pick you off before you even get a chance to hunt them.